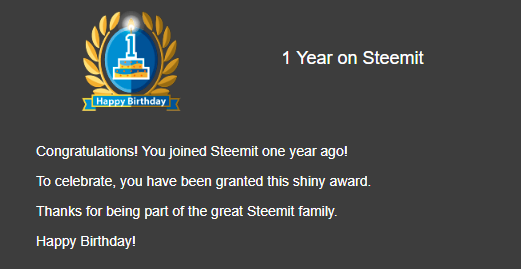 Yesterday I got my "1 Year on Steemit" Badge, the time has passed very fast and I'm happy with the achivments here on steemit that was made in the first year. This is also my first year in crypto and I have learned a lot about it. My first goal on steemit is soon done which is 1000 SP (currently~ 960) and after that I will try to get to 5000 SP. I am so happy that you are here, robi! I wish you a very rewarding expereince here in this loving and caring community :) Be happy! To see why 2479 Steemians use SteemPlus, install our extension, read the documentation or the latest release : May Budget Proposal.